The term "track lighting" usually refers to flush mount fitting long fixture with many mini fixtures attached that can be moved and adjusted to where you need the light, compared to a "fixed ceiling light". Track lighting can really make a difference in a room where there are definite lighting needs instead of just an ambient glow. You may need more light on some art on the wall, or you want to highlight your industrial style pieces, or the kitchen or you simply want the option of adjusting the lighting. If the industrial or rustic decor is your style, you can also get these in the typical track lighting. These work super well on a high ceiling. We had this style of fixture in a vaulted ceiling and were able to adjust the lighting to the spots we wished to highlight in the room. These are functional pieces of art in my opinion. Gone are the days where you spent a ton of time, effort and money to make a room match your personality only to try and hide plain old lights. Make the fixtures match the decor and they work double time. Good lighting when you need it and a good looking piece when they are not in use. Below are some great pieces I found that are affordable and could be the only lighting you need if you direct them in the proper direction. This fixture can be ceiling mounted or wall mounted. One fixture that offers 4 different lighting direction options. I love the cage around the bulbs, giving it that old world rustic look but with modern and safe electrics. Once installed take the time to decide where you want the most light and you will be surprised at the amount of light these give off. Although this does tend to hang a bit like a chandelier, the spot lights are completely adjustable. If you have the ceiling height, these would certainly add to the ambiance of the room. They play the part and could be in a living room or even over a dining table or kitchen, as long as you can spare the height. These will definitely give you that rustic style. I included this light fixtures even though it is not "technically" track lighting as the bulbs are not adjustable, but I thought it was really rustic and the bulbs do tend to go in different directions. It would be a great dining table fixture of a ceiling fixture if you don't have the room for hanging track systems. It all depends on your lighting needs and the room available to you to add some extra light. As you can see in the picture above, industrial style track lighting can really add some pizzazz to a room. You can adjust them and they still look great when not in use. 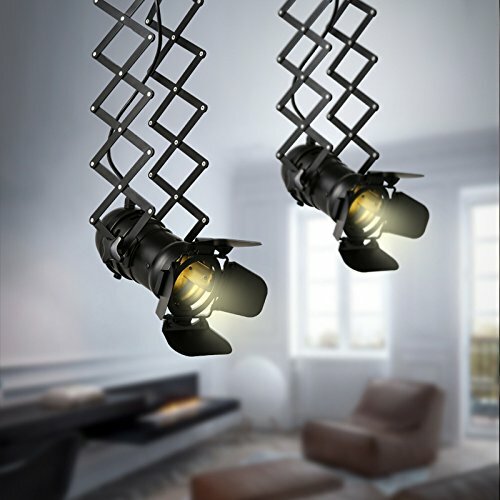 I thought these adjustable lights were really cool and would play the part in any rustic/industrial decor. They are an art piece all by themselves when not in use and you can adjust them up and down as well as rotate. They are one light on a system, and you could place a few around your room as to where you need the lighting most. Super cool and I found these online. I have yet to find industrial track lighting in my local lighting store! So if you are looking for unique, check online. Click any of the above pictures or links to find out more. This particular fixture I came across, is a cross between a pendant light or chandelier and track lighting as each bulb can be adjusted and sports the rustic styling. If you want to keep with the rustic theme, then you need to use the edison style bulbs (below) to get the right look. They are safe and modern but sport the old world style and give off some really nice lighting. You can get these in different shapes and sizes, but they are safe and modern but styled to look old world. You don't want to invest in a light fixture that is styled to look old world, and then stick a modern bulb in it. These are affordable especially online. Check to see if the fixture you choose comes with any bulbs, some do. I have been checking out magazines, and have seen many different ways to use industrial lighting and styling. You can mix them up a bit if you find it too dark a look, A look I find really cool is to have one wall in your room as the focus wall and install bricks or faux bricks (which are super realistic) and then make the rest of the room white, then add some dark industrial style light fixtures or floor lamps. That alone would create a really rustic look. If you love a darker look you can add rustic pieces of furniture and artwork, or even cover a wall or patio door with a industrial look curtain to really bring the room to life. There are no rules when it comes to your own personal design, just that you need to stay safe. Don't go digging in thrift shops of old fixtures unless you plan on having them safely rewired, which can get expensive. I could never find original or rustic looking fixtures at my local lighting store, so I started researching online and if you are in North America, there are tons of ideas and light fixtures online that you simply won't find at the local Home Depot that are safe and inspected but look old world. Hopefully I have inspired you to rethink your lighting, and come away from the plain builder style lights and include your fixtures as part of the look you are going for. They act as functional pieces of art when not in use. Make your money work double time!